I thought it was time for another post. 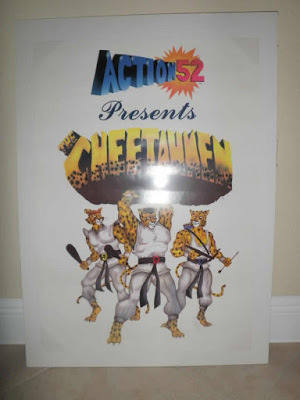 Let's talk about my one-of-a-kind, original, vintage, Action 52 Artwork. I had posted it up for sale a few months ago along with my Action 52 Prototype Cartridge but as I mentioned in other posts have decided I'm keeping them. That being said, I have pondered the thought of professionally reproducing and selling them, probably a limited numbered series type deal. If you haven't already noticed, I added a Poll widget to this blog. It was on the right hand side of all pages. Since its inception, 172 folks have voted on whether or not they would be interested in acquiring one of these. As of today , 83 (or 48%) have said Yes, 71 (or 41%) have screamed NOOOO !!! !, and 18 (or 10%) have voted a very neutral but encouraging Maybe. 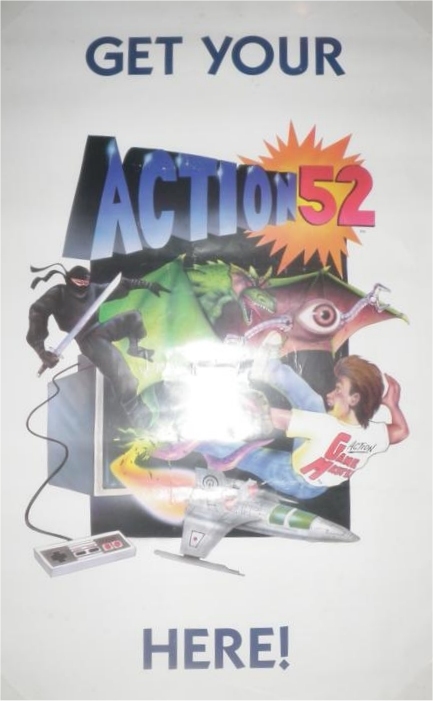 I'm very excited about the possibly of sharing this Action 52 legacy. 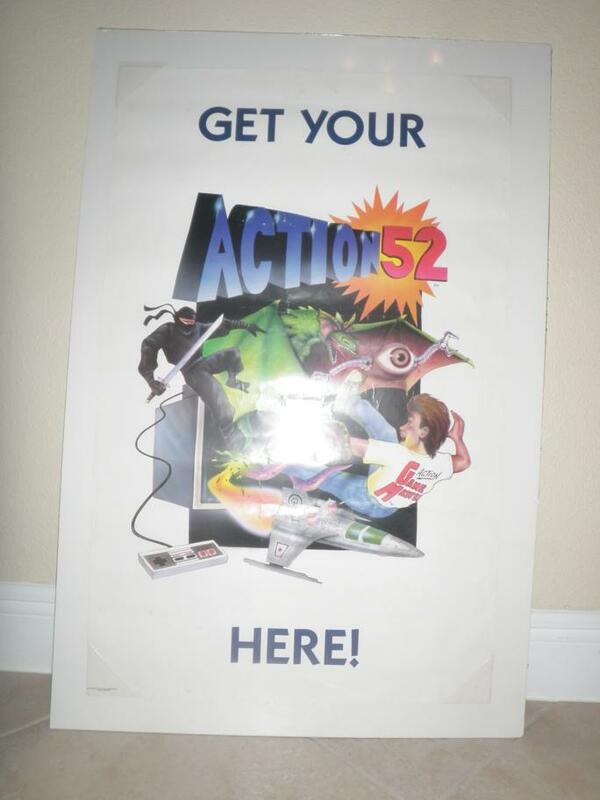 Action 52 is a part of gaming history. We can't erase it. The history is here to stay. It's utter failure and unattainable goals have propelled the project into infamy. While I was one of the young and naive developers that had high hopes for the project, I agree whole heartedly that it was a just an utter flop, there's no denying that. However, I also believe, and I know I speak for the rest of the developers, that we, the developers, only had the best intentions. I can't speak for the owners though. While the history is already written, the future isn't. Yes, things can stay the same and it can be remembered for all the rants and raves the project is currently known for. Or, the future can surprise us with a new chapter to the story. One that will be talked about, blogged, tweeted, etc. and cast a different perspective on the Action 52 brand. That perspective may be, oops or oh no, it flopped, again, or, it can prove to be one of the most successful brand recoveries in gaming history. Either way, it's definitely going to be interesting. This artwork is part of that history, and future. 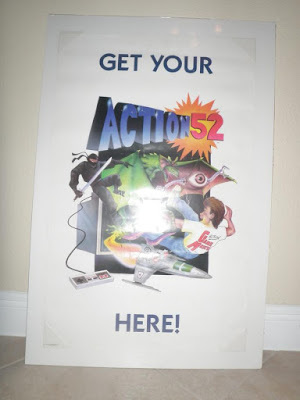 When I think about what Action 52 is and what it may soon become, it's really exciting. Thanks to EVERYONE that voted !